There is a hotspot of Big Data and KI in Cologne – I was not aware off. 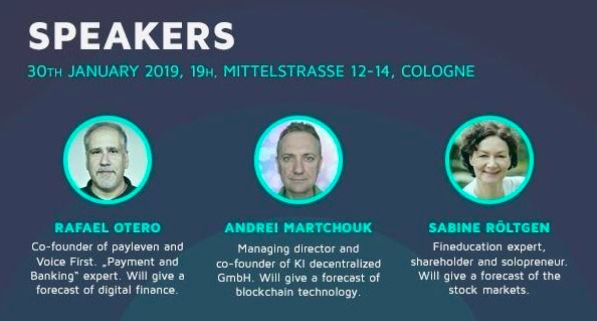 Following the invitation of MEETUP to Finfinity – I was directed to the expensive shopping street in town Mittelstrasse 12-14 Cologne 4thFloor – the company area of KI Group. It is a wonderful building from the 50ies– marble floor and shiny staircases. We could call it fancy. Their business is banking. The topic was tech: Blockchain, voice used in banking and investment in shares. 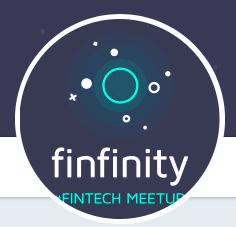 The inviter for this meetup finfinity is Natallia Martchouk, a programmer and founder of Trimplement.com – a fintech Company in Cologne who creates ewallets for payment systems. Natallia is the chairperson of 12 high specialised software guys. She started the open community and publishes in the youtube channel finfinity and loads up all the recordings of the sessions. This session was #13. Well the first speaker is Andrei Martchouk, her husband – who is one of the super techs of blockchain. His speech was very interesting. I have still a hard time understanding what it is all about. But I do not give up. I even worked hard the next day to follow the steps one by one and read what others write about blockchain. But he started talking not so much about technology, but on the history of the movement itself. His presentation was animated with snapshot of twitter posts – and these where not from yesterday. So he started with the Japanese Satoshi Nahamoto and the whitepaper he posted in 2008. He did not use the word blockchain himself. https://en.wikipedia.org/wiki/Satoshi_Nakamoto He created the first block on January 3rd, 2009 and on January 11th, 2009 there was a first twit of Halfin (Hal Finney) who mentioned the running of the system. January 12th was the first transaction of 10 Bitcoins from Hal Finney to Phil Zimmermann – who is a very known Cryptologist. The movement started and formed groups of mindlike people. “Cypherpunk” the group made the first Bitcoin. This was the beginning. But the movement went into several directions and the currency bitcoin is one – the other is the creation of other “assets” or Tokens. In 2014 “the big vison” was published on twitter.com/polemitis – a digital currency community. But the more people use blockchain – the transactions get more expensive. Why to replace an old system, when the newer is more expensive? According to Andrei that makes no sense – so we need to find the new for blockchain – not old business models in new technology. I think here was the part when he lost me. I fully understand that transactions in banking cost fees – the more you bundle – the cheaper it is. The blockchain technology offers now bundling of 10.000 transactions in one – and this is only the start. The big topic in the community is the limits of transactions – as they might be to many for the system and too expensive. Segwit was an early developer. The lightning network is a follower. (Listen to Danny from BTC-Echo in German) for the focuses on bundling transactions and makes them cheap. A big topic – because if the prices are too high for scaling up – it is dead. Andrei made clear for me that here we have a new paradigm. The old one was based on hierarchy – all transactions had to go through a system, controlled, saved and protected and legitimated. That was where the fees are coming from. This is the core of banking. With the new technology, hierarchy is not needed – even not wanted. The blockchain technology was developed to be free of capitalistic power groups and is free for direct transactions between me and somebody. It is a one to one connection. That is the basic – and where is the business, I asked myself? And this is not a currency like the bitcoin. I understand that you create a project and you estimate a value – give out tokens – people buy them and create the fundamentals for the project to start. You can trade them – but mostly it is like a partnership. They call it ICO – Initial Coin Offerings – which is similar to a company with the IPO where you give out shares. Artikel For me it sounds like crowed funding – which is not traded with a bank and Euro – but here the project uses the system of blockchain and creates assets you buy. You do not make a deal with a bank or a company, you make a trade with a system. I have seen some of the created art with blockchain – a digital piece of art – frozen in a blockchain to be traded. Some reach enormous value – and it seems to be a hype to combine art – digital – and blockchain. Yes there have been big events even with Christies in London, as they fear that the art market might move into the internet and blockchain – as the transmitter the trading house is not needed any more. More ARTNOME.com This article by Jason Bailey reflects the same experience and questions I have. When I saw the green frogs – cards of games ? – I was not willing to believe that people like it and pay a fortune for it. That should be the business in blockchain? Frogs? Read this similar lines in the article. “In my conversations with Joe, Matt, and John, a common theme was the need for more folks to try new things and explore for the sake of exploring. 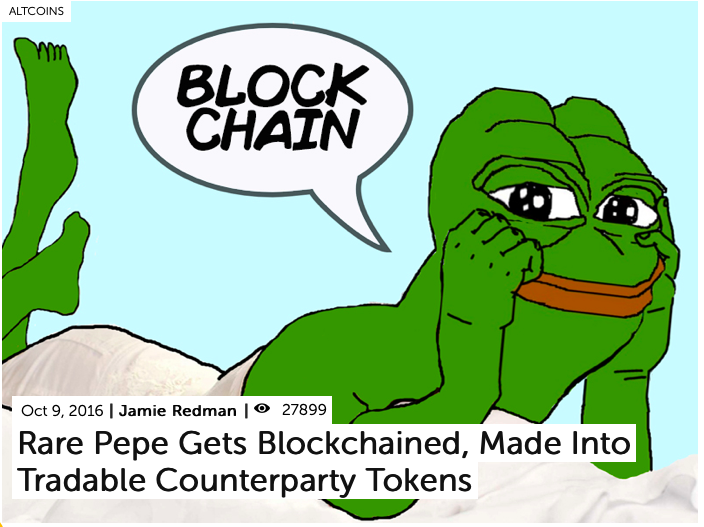 When Joe started Rare Pepe Wallet, he didn’t know people would spend $1.2M on tokens associated with drawings of green frogs. If you had done a survey with a focus group of 100,000 people, I am certain none of them could have predicted that collecting frog memes using real money would become a thing – but it did. As he recently said in a Telegram chat: “…it’s better to build a product people want to congregate around rather than try and build a community to use a product. I just write applications that people like to use. ”Natallia told me that her company has also started to work directly with artists. So it might be true – even when we do not jet understand it – that there is a new business model out there that is just developing like airB&B 15 years ago. But it might be the playful nature of the software developers – if your core business is banking and e-wallets – you might love to play around. Perhaps it is all but communication. When a IT-guy explains this movement – they are excited by the possibilities to act and create. We as the listeners are too much in our old models of buying and selling – to see the real advantage. What is the business model? But perhaps we just need some people who can describe it in another language …. It is worth keeping an eye on it. My whole life I had to explain complicated tech stuff, from cars to aircrafts – from balance sheet to IFSR. So I am sure I will understand it one day and be the one to explain it to others.